At the kind invitation of "Brotherhood of Beekeepers of Ukraine" (President Sergiy Gnatovych Ulasik) and "Ukraine Association of Beekeepers" (President Leonid Ivanovych Bodnarchuk) Asger Jorgensen, President of Apimondia and Cristian Constantinescu, FIITEA Director General, paid a visit to Kiev, Ukraina in the period of August 17-19, 2007. 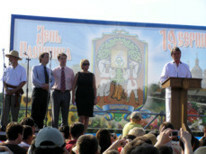 The visit took place on the occasion of the Honey Feast Day in Kiev. Representatives of the industry from all over Ukraine attended the events organized by the beekeeping organizations and ZIP Technologies Ukraine, LTD. 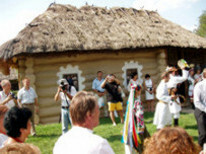 In Kiev one could see posters and banners advertising the beekeeping events consisting of exhibitions and honey and beekeeping equipment fairs, folk dances performances, folklore fashion shows, and other attractive street events. Program of the visit also included participation at the International Seminar dedicated to the issues of Ukraine integration into the world beekeeping society and economics, where key personalities in Ukraine beekeeping scientific circles and industry took part. 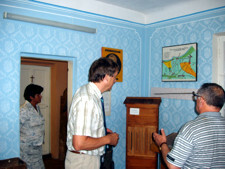 Visits to the Beekeeping Museum (one of the largest and most comprehensive beekeeping museums we've ever seen) and the Village Park Museum where the hosts organized some of the beekeeping events and where even President of Ukraine, Viktor Yuschenko, spent a few hours and delivered a speech to a gathering of a few thousand people. 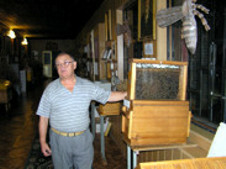 Ukraine is one of the largest beekeeping countries in the world. Presently, there are over 400 thousand beekeepers and there are 3.5 million bee colonies. The average gross production of honey reaches 50-55 thousand tons per year. 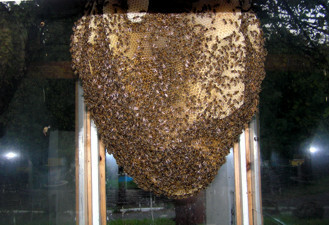 However, this year (2007) a good beekeeping year, the production is estimated at 70 thousand tons. During the visit we realized the great potential of Ukrainian beekeeping and their desire and determination to integrate fast into the world beekeeping community. We have been impressed by the spirit of good relationship and collaboration among the beeping organizations and the support of the authorities to this extremely important sector of the economy. The beekeeping organizations participate together in a large delegation at Apimondia Congress in Australia bringing an interesting exhibition at the Apiexpo. They also intend to forward their candidacy to organize an Apimondia Congress in the future.